Product prices and availability are accurate as of 2019-04-18 13:27:46 UTC and are subject to change. Any price and availability information displayed on http://www.amazon.com/ at the time of purchase will apply to the purchase of this product. Author Bookstand is proud to offer Pump Power by Bookstand Publishing. Bookstand Publishing offers books by the best indie authors throughout North America and the world. Bookstand Publishing is dedicated to offering original content to a broad audience and promoting great authors, literacy, and freedom of expression. Pump Power has generated a lot of interest and excitement and we think it would be an excellent addition to your library. PUMP POWER encourages women to overcome anything and become everything they were created to be. 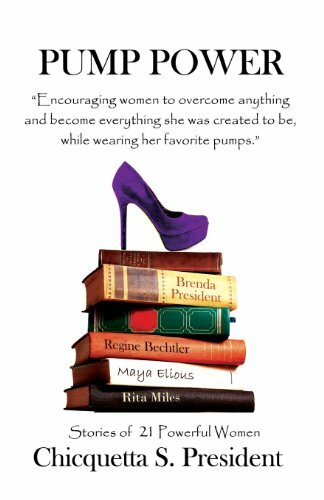 Realizing that life obstacles at some point make you feel like giving up, PUMP POWER was created to inspire, empower, and uplift women to live phenomenally -- while wearing their favorite pumps. 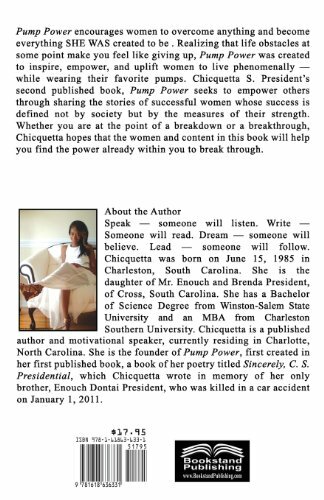 Chicquetta S. President's second published book, PUMP POWER seeks to empower others through sharing the stories of successful women whose success is defined not by society but by the measures of their strength. Whether you are at the point of a breakdown or a breakthrough, Chicquetta hopes that the women and content in this book will help you find the power already within you to break through.